The most important part of your face is your hairs. Hairs enhance your personality. We do many hair styles to change our look. Male or female all need healthy, strong, smooth and shiny hair. The market is full of hair products like hair mask, serums, shampoos, conditioners, hair oils and so on. In this fast moving life, where, we don’t have time not even for food, we run after all the possible quick fixes for everything. But the reality is every product is made up of chemicals. We are searching natural benefits in every chemical product. If you really need natural help for yourself then you need to go for natural things. 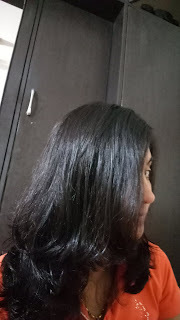 Few days back, I tried DIY Honey and Banana hair mask for my hairs. You just need 2 ingredients to prepare this mask. Mash the ripe banana properly, here with "properly" I mean try to make a smooth lump free paste. Now add 1 tablespoon of honey to it. Apply this mask with your hand and leave it for half an hour. Now wash your hairs with your regular shampoo. This mask works well on frizzy and dry hairs. We all know the health benefit of banana. It is a complete food and good for every age. Banana contains fiber, anti-oxidants, potassium, Vitamin B6, Vitamin C, Magnesium, protein, carbohydrate and fat. Banana and honey’s properties soften the hair, protect from split ends and breakage and maintain the hair’s natural elasticity. Review: This mask is no doubt little messy and would be difficult to clean the hair easily. Even while combing you will find banana’s particle on floor, but you will definitely find your hair much smoother than before. Note: You can mix 1 tablespoon curd for dry hairs and 1 tablespoon lemon for oily hairs in the mask.